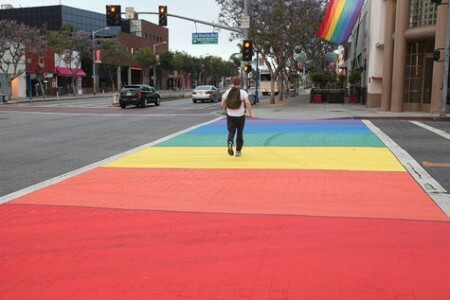 WEST HOLLYWOOD, CA — The city of West Hollywood has announced that it will make permanent the temporary rainbow crosswalks installed back in June in honor of gay pride month. Steve Campbell, the city’s facilities and field services manager, told LGBTQ Nation that the colored thermoplastic markings and specialized paint for the crosswalks are being custom made to match the six colors of the gay pride rainbow flag. Campbell acknowledged that the estimated cost to upgrade the rainbow crosswalks is around $67,364. He said the cost for the initial temporary installation in June ran $13,000. The West Hollywood City Council had approved the permanent markings of the crosswalks during an August 20 meeting, stating that the project will help market the city as an LGBT tourist destination. Campbell said that city workers will install the permanent markings during late-night hours on weeknights to minimize added traffic congestion.